The Dietary Guidelines encourage you to enjoy your food, but eat less and to avoid oversized portions. The amount you eat or drink plays an important role in your energy balance strategy. Most people eat and drink more when served larger portions. Choosing smaller portions can help you lose weight and keep it off. Portions have increased over time. See examples here. You may be eating more than you realize. Some common food portions can equal the amount that is recommended for the whole day. For example, on a 1600 calorie Daily Food Plan, 5 ounces a day of grains are suggested. Some bagels weigh up to 5 ounces – the entire day’s allotment of grains! Your Daily Food Plan helps you manage your daily intake by recommending the amount of food you need from each food group. Your portions at each meal do not need to be any specific amount-but to stay within your energy needs, the total amount you eat each day should match the total amount recommended for each group. For example, 1 regular slice of bread counts as 1 ounce of grains. This doesn’t mean that you have to eat a sandwich with one piece of bread. It just means that if you eat two slices, you should count them both toward your total grain intake for the day. Measure how much the bowls, glasses, cups, and plates you usually use hold. Pour your breakfast cereal into your regular bowl. Then, pour it into a measuring cup. How many cups of cereal do you eat each day? Measure a fixed amount of some foods and drinks to see what they look like in your glasses and plates. For example, measure 1 cup of juice to see what 1 cup of liquid looks like in your favorite glass. To see what 1 cup, ½ cup, or 1 ounce of some different foods looks like, visit the food gallery and find some of the foods you eat in each group. Prepare, serve, and eat smaller portions of food. Start by portioning out small amounts to eat and drink. Only go back for more if you are still hungry. Pay attention to feelings of hunger. Stop eating when you are satisfied, not full. If there is still food on your plate or on the table, put it away (or throw it out). Repeat the phrase “a moment on the lips, a year on the hips” as you do this. A simple trick to help you eat less is to use a smaller plate, bowl, or glass. One cup of food on a small plate looks like more than the same cup of food on a large plate. It is important to think about portion sizes when eating out. Order a smaller size option, when it’s available. Manage larger portions by sharing or taking home part of your meal. When Eating Out, Make Better Choiceshas lots of tips to help you eat only the amount you need when eating out. If you tend to overeat, be aware of the time of day, place, and your mood while eating so you can better control the amount you eat. Some people overeat when stressed or upset. Try walking instead of eating, or snack on a healthier option. For example, instead of eating a bag of chips, crunch on some celery, or instead of eating a bowl of ice cream, enjoy a low-fat yogurt with fresh blueberries. Making healthier choices is better for your weight and can also help you feel better. “I don’t have time to measure out my foods all the time.” Being successful at decreasing portion sizes doesn’t mean that you have to measure every meal or snack you eat. Once you’ve taken the time to measure out a few examples, you will be able to estimate portion sizes better. Plus, just eating or drinking less than you normally would means you are decreasing your portion sizes. “My Daily Food Plan tells me to eat more of some things but also to decrease portion sizes. I don’t understand if I should eat more or less.” The recommendation to decrease portion sizes is particularly important for high calorie foods or for foods with a lot of empty calories, such as cakes, cookies, sugary drinks, and pizza. It is important to Focus on Foods You Need. For example, eat a large portion of steamed broccoli (but with only a very small amount of butter or cheese sauce, if any). “I like to eat a big burger every once in a while. Are there other ways to eat less?” In general, it is a good rule to eat and drink smaller portions. You can occasionally eat or drink foods in larger portions, but not as part of your daily diet. Make that big burger a “once-in-a-while” special treat, and on most days choose the smaller options. “I was always told to clean my plate.” Resign from the “clean your plate” club now. Stop eating when you are satisfied, not when your plate is empty. Start your meal by only eating half of what’s on your plate. Stop for a moment and decide if you really want to eat more. 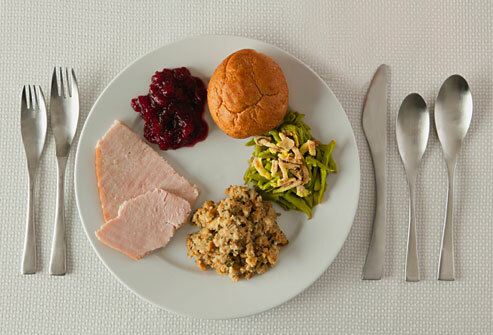 Don’t forget that you can save some leftovers for another meal or snack. Learn more about keeping food safe to eat. Nothing has to go to waste, and the food will taste better when you are hungry again! Don’t take anything, even this, too seriously.